The travellers from around the world visit this 15th Century fort and stay in one of the magnificent rooms with royal elegance to not just explore the nearby destinations but also to experience the charm of residing in a mystical fort like a king. The warm hospitality and excellent services at the fort accord the royal feeling to the guests. It is a very beautiful fort with interesting historical past and is visited by couples and families on weekends for understanding the accustomed lifestyle of middle ages. Also, tourists from distant places with the will to visit Sariska tiger sanctuary, prefer to stay in one of the elegant fort rooms rather than newfangled hotels to hold the traditional way of living in high regard. The classical comeliness of the castle has been restored artistically, albiet the fort is resourced with all the present-day amenities for comfort of the modern man. The guests relish their stay with the authentic Rajasthani buffet at fixed rates. The beautifully manicured garden surrounding the fort, unspoilt nature and enormous variety of recreational activities here are a source of special delight. The windows and terraces of the fortress further offer the views of the oldest fold mountain range - The Aravalli and the nearby villages. The fort has air conditioned private rooms for guests resourced with amenities and fixtures that are required to offer the comfortable stay to the guests. The archaic furniture gives it a rustic look amidst which royal family once lived in the same fort.The room has a double bed to sleep two persons and a private, rooftop terrace. The surrounding view is mystical and carries the occupants to the world of dreams. The concierge at the fort goes beyond the limits to make the guests happy with services and requested assistance. The housekeeping staff plays a good role by keeping the place tidy. The private rooms are cleaned carefully by the staff daily to provide well-arranged surroundings to the guests. The buffet food is offered to the guests at fixed rates. The fort has two swimming pool and health spa to relish Ayurvedic massages and rejuvenation programmes. The fort also has a tennis table and indoor games for guests. For three to four persons, a vintage car ride is arranged around the fort. The guests here can also enjoy flying fox and camel ride arranged by the staff. The breakfast, morning bed tea and evening tea are complimentary with the room. Following are the rule to be followed at the heritage fort: 1. Personal liquor is not permitted. 2. If space permits, an extra bed can be arranged at additional charges. 3. Playing loud music is not allowed in the open areas especially after 10 p.m. 4. The guests are liable for any damage incurred to the property during their stay. 5. Guests are required to provide valid Identification at the time of check-in. 6. Foreign nationals and diplomats are required to show their passport and visa. Pick up and drop off facilities are provided on request at extra charges . They have a facility for organizing conferences, weddings and for shooting videos and movies. The fort is Vast and is a good place to relax and soak in the nature around. 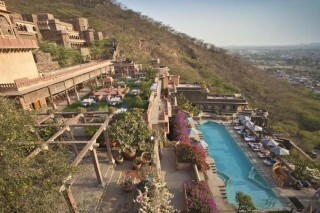 The fort has two swimming pools for guests and spa for relaxing ayurvedic massages. 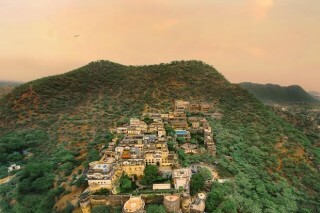 The beautiful gardens and terraces offer majestic Aravalli and farm views. 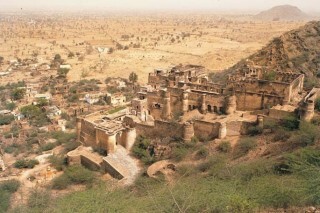 The traditional look of the fort transports the guests to the medieval times. 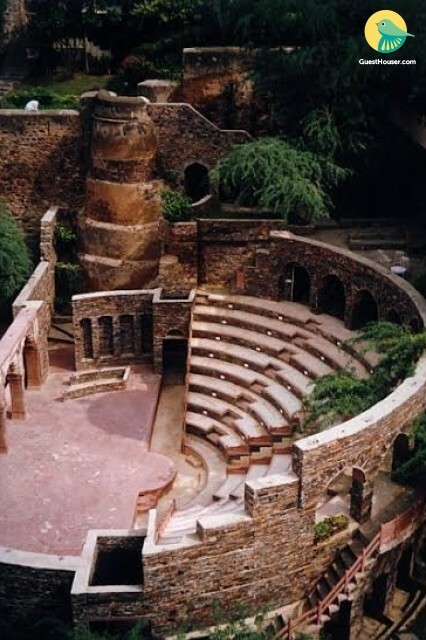 The guests can enjoy the audio-visual tour of the fort to know about its history and the tour to the eighteenth-century stepwell situated near the fort. Zipping is another exciting activity that the guests would love to try. The camel ride to nearby villages is a wonderful treat. 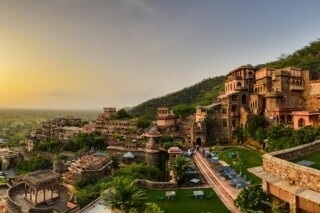 Although people visit fort to experience the charm of residing in a royal setting, It is important to note that it is near Alwar - 75.6 kms and not very far from: Jaipur - 157 kms Delhi - 116 kms Mathura - 184 kms and lastly Agra -242 kms In Alwar, the guests can visit beautiful places like Alwar fort, Nikumbh Mahal, 6th century Neelkanth temple and Alwar museum.